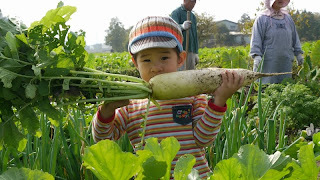 Kyoto is a million city but big farming areas stretch around the city. My father owns several ridges about 20km from the city center. 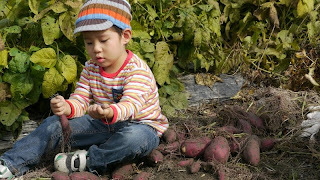 Last week we went there and harvested the autumn vegetables. 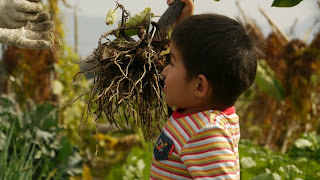 We took green soybeans, radishes, sweet potatos, broccolies, Kaki (Japanese persimmons), Satoimo (Japanese taros), Carrots and some more. Japan is thought one of the most expensive countries of the world. I don’t think so nowadays, but about vegetables, I have to say yes. It might be excusable in this mountainous country. So my fathers fields are the grateful small market for us.